Fight for Liberty should be required reading for every college student—indeed, for every American and, regardless of their nationality, every person capable of reading and understanding the 1776 Declaration of Independence and the 1948 Universal Declaration of Human Rights. To comprehend the threats confronting our world and consider what to do about them, reading and re-reading this book’s essays will be worthwhile. Most of the essays are short and to the point—ideal for seminar discussion. Many readers will need to look up some terms and events referred to in Fight for Liberty. Supporters as well as critics of President Donald Trump should read these essays. The book will provide an anchor for each set of readers, helping them to evaluate the traditions and values they endorse or oppose. Authoritarian rulers in China, Russia, and elsewhere will benefit from a deeper analysis of the challenges and risks they take in repressing intellectual, political, and economic freedoms. Citizens in the United States and other democracies will be fortified by deeper appreciation of the philosophical and empirical foundations of their beliefs. Fight for Liberty consists of more than 30 short essays by world-class intellectual leaders in a variety of disciplines. Some are known as conservatives and others as liberals, but their views converge on the threats posed by the rising tides of authoritarian and tribal politics. Those who fail to understand past mistakes will be pressured to repeat them. Part One of the book lays out first principles such as the need for truth by Roger Scruton and the benefits of globalization by Jagdish Bhagwati. Part Two presents threats such as Vladimir Putin’s “orchestrated chaos machine” by Anne Applebaum and China’s rise as a “statist great power” by Minxin Pei. Part Three suggests policy responses such as stronger U.S. leadership by Max Boot and buttressing the “university’s covenant with liberal democracy” by Johns Hopkins president Ronald Daniels. The last entry is a 15-point Renew Democracy Manifesto calling for fresh thinking about good ideas. The inspiration for this book developed after Donald Trump’s election in 2016. Many of the chapters target Trump’s policies, many of which the authors see as antithetical to what should be done. Though most of the essays are quite up-to-date, many reach back in time for perspective. For example, editor Mark Lasswell frames his essay on today’s global anti-press crusades with John Milton’s response to the Catholic church’s restrictions on Galileo Galilei for his views on astronomy. Milton, 35 years old in 1643, was a Puritan but he opposed the pre-publication censorship demanded by the Puritan-aligned English parliament. Government-controlled printing reminded Milton of the Inquisition’s fear of new thinking. Lasswell rounds out his chapter with references to thought-control in Nazi Germany, Stalin’s USSR, and today’s dictatorships in North Korea, Turkmenistan, Uzbekistan, Iran, Cuba, Venezuela, and Syria. This is the setting in which Lasswell discusses Trump’s attacks on the established media, to which one could add the president’s symbiosis with Fox News. Lasswell knows first-hand about press freedom. Having served for four years as an editorial features editor for the Wall Street Journal, he was let go in 2017 by his boss Paul Gigot for seeking op-eds critical of Trump’s business practices and raising questions about Trump’s alleged ties to Mafia figures. In May 2018 Lasswell became associate editor of The Washingon Post’s op-ed department. This book does not try to articulate the views of those who support President Trump. Nor does it offer a serious assessment of “democracy”—its dangers and shortcomings as well as its potential virtues and achievements. If democracy can yield elections rigged by gerrymandering and an atavistic electoral college, if most Republican law-makers and voters approve of Trump whatever he does or says, is democracy an unblemished good? 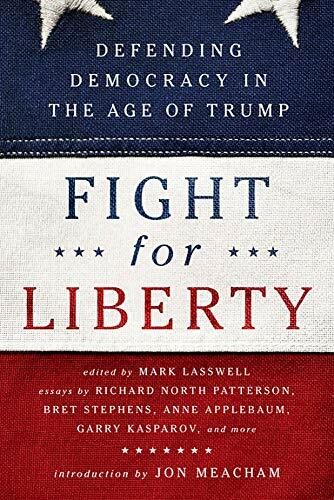 The authors of this book may call for “renewing” democracy, but how do they propose to change the values and beliefs of those voters whose thoughts and sentiments are shaped by daily doses of real “fake news”?